Good morning and welcome this week’s Six on Saturday. Well Storm Ali certainly had a bit of bite to it on Wednesday. My garden survived relatively in tact. A couple of plant pots got blow over and my Dahlias suffered some wind burn. I was off yesterday and spent most of it tidying the garden up and taking more cuttings from succulents. This weekend I will be starting to plant up planters with spring bulbs. This photo was taken before the Storm on Wednesday and as you can see this Dahlia has been prolific this year. To be honest my Dahlias have been a pretty mixed bag this year. Some have performed well and others have been a disaster. I have already put my order in next year and in the next few weeks I will be filling up my new Dahlia bed. I am just waiting for the leaves to start to fall to make some leaf mulch. One of the casualties of the wind was Dahlia Checkers which was in a large plant pot on top of some sleepers. It took a bit of a battering so I have decided to store the tuber earlier than usual. This was a new plant this year from Pheasant Acre Plants. As you can see by the size and health of this tuber this plant has been one of the show shoppers in the garden this year. I only haveq 2 Dahlias left in the garden now but both are still hanging in there. This photo was taken in yesterday’s fading sunlight. I have taken a few Aeonium cuttings and most are starting to root. It is going to be interesting to see how some of the Aeoniums manage a Northumberland winter but they should be ok as the garden is pretty sheltered. 4. Salvia Patens Deep Blue. This is a lovely coloured Salvia. I bought this for £1.99 at a garden centre near Scarborough at the end of July during the drought. Over the past few weeks it has quadrupled in size thanks to the rain. I like the colour of its flower. It is called deep blue but it looks more like an electric blue to me. This is a new cultivar from 2016 and as you can see from the first photo it was looking health and vibrant until Storm Ali and I got my hands on it. It took a lot of a battering and was leaning a bit. Thinking the rootball had partly came out (I had recently plantEed it) like a plum. I tried to yank it out with my hands, I am sure you can guess the moral of the story ALWAYS US A TROWEL. I have replanted it and hopefully it will root again. Thismbundle of joy arrived this week. No point keeping then hanging around so these will be planted this weekend. 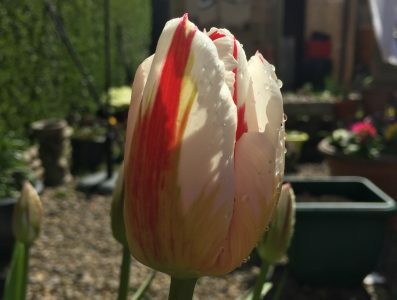 I will be using 2 different kinds of tulips per big pots and if I have any large pots left I will just have to buy some more tulips! No point them must sitting there doing nothing is there. That is my SOS for this week. It looks like today is going to be the best day of the weekend so I will make the most of it and start in the garden early. That Salvia is a great colour, very vivid. And a bargain! I planted a couple of packs of bulbs a few weeks ago but have another two bags to do. Not sure where they’ll go and I can’t really remember where I planted the others so I suspect many of the first batch will be accidently dug up. We got Helene before Ali. The ground’s waterlogged so bulb planting is deferred until (I hope) next weekend.A lot of people are saying that this has been a poor year for dahlias; mine are just starting to flower now but they’re not up to much, Though that’s a fine tuber you have for a first year plant. Aye it’s a whopper of a tuber certainly. Hopefully it will be a better year for Dahlias next year. What bright colors are those of yellow dahlia and blue salvia ! Here too we had gusts of wind last night and like you I lost flowers. Fortunately, I had already taken photos but my dahlias have lost half of their flowers, but this is not the time to dig them up like you, though… Apples and hazelnuts are also on the ground. A cake for this Sunday ?. Thanks Fred. It is a tad early up here to start storing Dahlia tubers but I thought I would give it a try just to protect it from the woumd the pant got, it should be ok. Apple and Hazelnut cake sounds devine! The blue salvia is a very vibrant colour. Have fun potting up all those bulbs…one of the best things about gardening is planting new things, I think. Thanks Jane. I will do. I don’t have a good yellow Dahlia, I’ve planted a couple and they’ve died. I think I’m drawn to the warmer yellows, yours contrasts nicely with the Verbena but slightly jangles with the more orangey Coreopsis? Believe me, I know I have no right to cast aspersions on other peoples colour schemes, I’m just thinking out loud. Jim at the moment being a bit of a newbie gardener I don’t think a lot about colour scenes. The Coreopsis was in a lot and was looking sorry for itself so I stuck it in the garden to give it a boost..
We’ll all hope that tuber makes it through and doesn’t resent the early dig. I agree with you — quite an electric, gorgeous blue. I love the colour of that salvia! How stunning! Your Dahlia is a lovely clear yellow, I like it. And all those baby Aeoniums, how exciting! Oh, time for bulbs! We are behind here, but yes, it is time. I wish I could plant more. I just can not justify the expense for bulbs that grow like short term annuals here. There are not many than naturalize as perennials. We can pretty much guarantee that they will not bloom a second year. The climate is not right for them. I continue to complain about my dahlias this year. They have been poor. Not enough water/food. So it’s really me that’s been poor, not them! Good luck with your cuttings. That’s some salvia you got there. Hope your dahlias make it through winter. Really like how your verbena bananarama accents your garden. I see what you mean – that Salvia looks just the same. However, I didn’t have to pay for mine due to my generous #1 son-in-law! I do like the combination of your yellow dahlias with the purple verbena bonariensis.